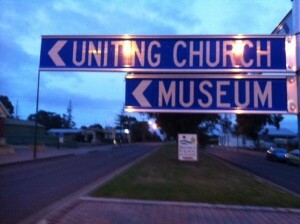 I’m in Melbourne for the weekend, speaking on mission to a church camp for Manningham Uniting. The family are flying with me and when I’m not speaking, we’ll be enjoying the sights, sounds and shops of Melbourne. I’ve been asked to engage with their governance group on Friday evening, do 3 interactive sessions with the whole church on Saturday, then preach on Sunday. It’s something I find myself doing more and more here in Australia – speaking at church camps about mission – I’ve got another two before the years out. A camp about mission. Is this a trend? Or something more Australian than Kiwi? It was great to drop into one of our integrative classes today for a lecture on the Missiology of Conversion. We have introduced two compulsory Integrative topics in our new Bachelor of Ministry. 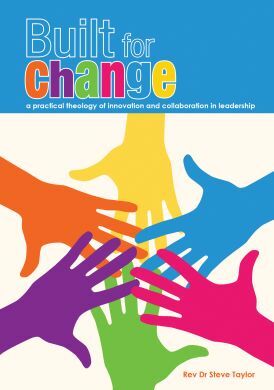 Rather than assume that by some sort of informal osmosis, students somehow miraculously become able to weave together theory and practice, Bible and ministry, leadership and theology, we’ve decided that we actually need to both model and expect integration. So the two compulsory Integrative topics explores six models of theological reflection (from Theological Reflection: Methods ). To ground the models, each year a different theme is chosen. 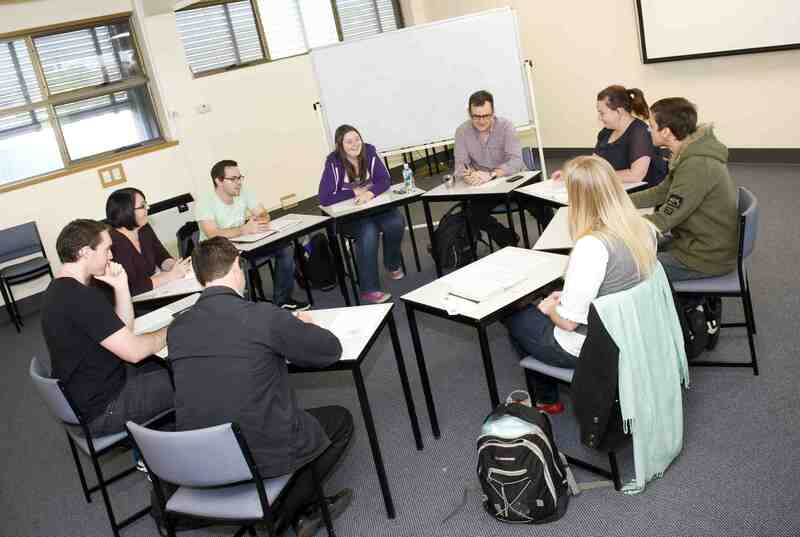 The four teaching streams at Uniting College – Bible, missiology, leadership, discipleship – speak to that theme, while the students workshop a case study from their ministry context, using one of the six suggested theological models. The theme this year is conversion. So on behalf of the missiology stream I introduced a number of contemporary missiologies of conversion. First, the Uniting Church Revised Preamble to the Constitution. I suggested the Preamble provided a fascinating approach to conversion – God is already present, faith must be embodied in just deeds, conversion invites all parties are in an ever-deepening Gospel process. Second, we sat with an essay by Wilbert Shenk in Landmark Essays in Mission and World Christianity which outlines trends in mission in the non-Western world. What do we need to hear, to absorb, from all parts of the globe, not just the Western part, as we begin to think about conversion? 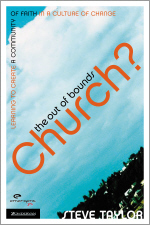 What are the best practice insights regarding church, Spirit, Jesus, gospel and culture that need to be shaping us? 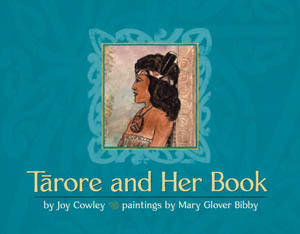 Third, a childrens story by Joy Cowley (Tarore and Her Book), which documents how indigenous people in New Zealand were the primary agents in the spread of the Gospel. Again, the story provides a fascinating approach to conversion – God is already present, faith must be embodied in just deeds, conversion invites all parties are in an ever-deepening Gospel process. What insights from the Preamble might guide conversion? What does “already encountered” (Para 3) mean for conversion? What practices would enable conversion to have a trajectory toward “same love and grace fully and finally revealed in Jesus Christ” (Para 3)? What does “integrity of the Gospel proclaimed” (Para 6) for the mission of the church, past and present? It was a rich and energising discussion – of mission, of Uniting Church theology, of history. One of my tasks as Principal is to write for various Synod publications. Here is what got compiled last week for the quarterly Treasurers newsletter. the joys and tensions of a “church serving College”? It is interesting to reflect on the activities of our College faculty over the last week or so. One is speaking over the weekend to youth throughout the State about mission. Another is speaking to a chaplains retreat about the place of lament in mission and ministry. Another chaired a gathering of lay folk interested in history, church and influence. Another led a 2 day annual leadership retreat for ministers of another denomination. Another is Interstate, speaking at a young adults camp. You get a glimpse of a College faculty deeply engaged in the life and ministry of the church. Which is very life-giving. The tension that results is around the multiple masters that a College serves. There is only so much a group of people can do. 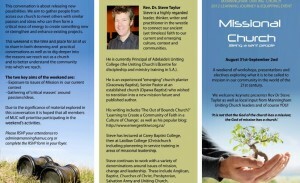 This post is another way for me to reflect on a recurring issue Can one College serve two masters: academy or church? I was most pleased with how the Magarey lectures whole Bible, whole people, whole mission series of retreat reflections ended. I concluded by pointed out how the whole time had been a risk. They had trusted me and they I had trusted them. Together we had trusted God and it had been rich. So why not continue this pattern of risk together? 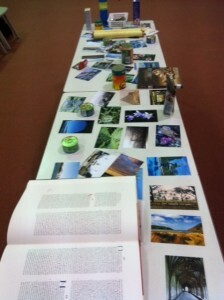 In preparation I had identified 5 “sense” projects (gathered from Sense Making Faith Body Spirit Journey ). 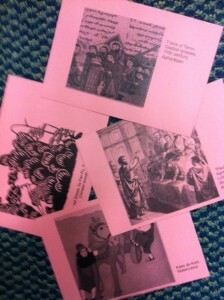 I had typed them up, photocopied them and cut them into separate cards. I walked around the room, inviting folk to take one. Here was the risk. That rather than me give them some options that they might or might not to when they got back home, that they would commit to do whatever sense project was on the card they chose. And the next time they gather, to be accountable by telling the stories of what happened. And then I played the scene from Lion, Witch and the Wardrobe, when Lucy steps through the wardrobe into another world. It’s a wonderful 2 minutes of taking a risk, to discover a whole new world. A wonderful invitation, a great ending. My first Principal “road trip” has come to an end. 11 lectures/talks in 6 days with 16 hours driving. This is part of what I did with the Churches of Christ ministers over the last few days. 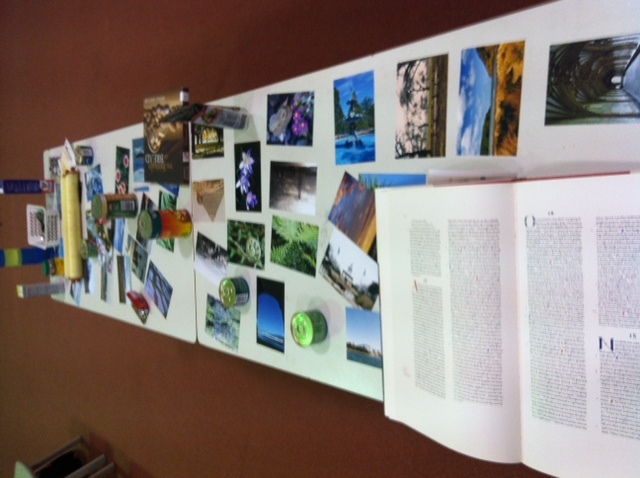 Around the theme of whole Bible, whole people, whole mission we explored the place of senses in the Christian journey. If we as leaders are give the gift of senses, and people in the Bible had the gift of senses, and people in our communities have senses, then how can these common touching points be lifegiving for our mission and our ministry. 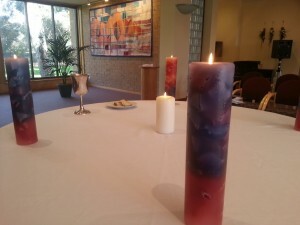 Hence the picture – a table with things to see, canned food to be used in intercession, a Saint John’s Bible: Gospels and Acts to appreciate, colour chips to explore our feelings, a scroll to remind us of the senses in the original, Biblical world. It felt risky, leading a group of strangers into new terrain. But the feedback – from a person a Christian less than a year, to highly educated leaders, to retired ministers – was overwhelmingly positive. 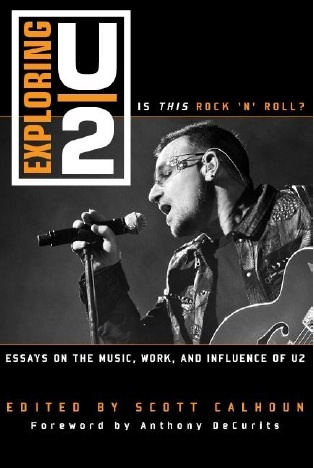 By locating the senses, a very wide range of engagement became possible – personal, how we read the Bible, justice, living well, being church, mission and ministry. 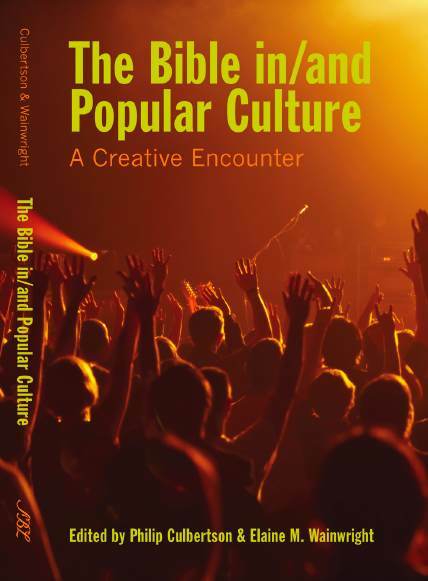 It provided a frame in helping me understand what I’ll be doing over these days with the Churches of Christ – engaging the Scriptures as experiential and alive. I will begin with some stories of my mission experience and then one by one, explore our God-given senses – introducing them to this resource. Update: Tonight as the woodwind instruments played, the birds outside the chapel began to chirp. Nature’s harmonies in chime! On Thursday I slipped into the back of a school concert, to listen to one of Team Taylor play oboe in the Senior Concert Band. Exhausted after a long day at work, including preparation for the Eyre Peninsula trip, it was exactly what I needed, a reminder of the power of music to invite, to soothe, to create space in which to be. Moessner notes the mutuality within a musical community and the non-hierarchical role of the conductor as a model for leadership. Here are the 7 principles of orchestration (55). 1. Remember that people, or music lovers, want to hear an orchestra, not an institution. 2. Look for the common solutions even in chaos, for chaos precedes the creative act. 3. 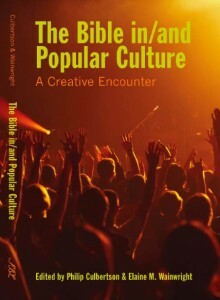 Accept repetition as a normal occurrence in the music of ministry. 5. Develop leaders (musicians) who are flexible, creative and also collegial. 6. Encourage a free exchange of ideas, or scores. 7. Understand that God is not necessarily efficient, but passionate. Sitting listening to “Mekong” on Thursday, it all made sense – not logically, but intuitively, artistically, beautifully. As part of my teaching I’d asked folk to make a symbol of their communities, which I then collected. During the concluding worship, these symbols were re-distributed, held and in small groups folk prayed for each other’s mission across the Peninsula. A wonderful expression of inter-connection. 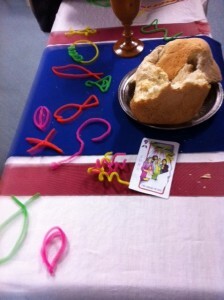 These were placed on the communion table. 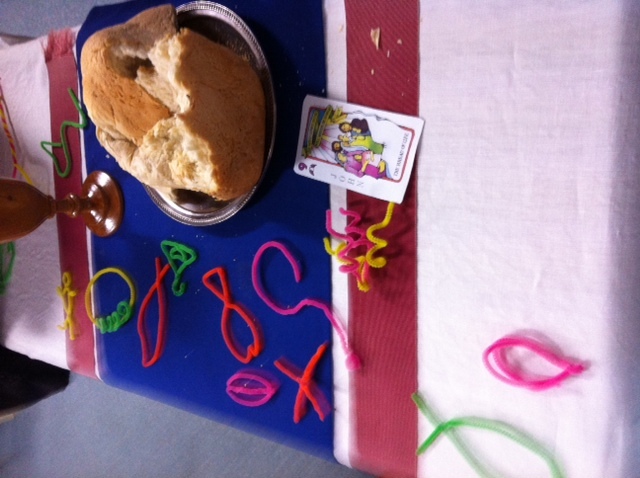 The lectionary text was John 6, so I had taken up a bread maker, which meant hot bread for communion. The smell a wonderful image of mission. 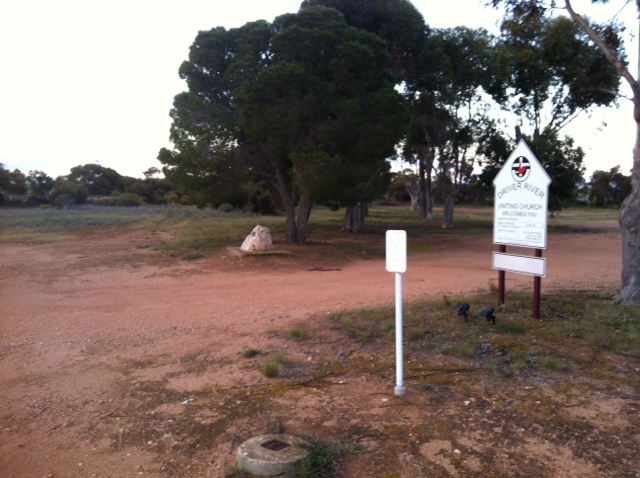 There were 41 folk from all 16 churches from across the Eyre Peninsula and lots of very positive feedback. Being told I’m “practical” and “commonsense” is very gratifying feedback from country folk from another country! I shut the door this afternoon and found some space to do some creative planning. 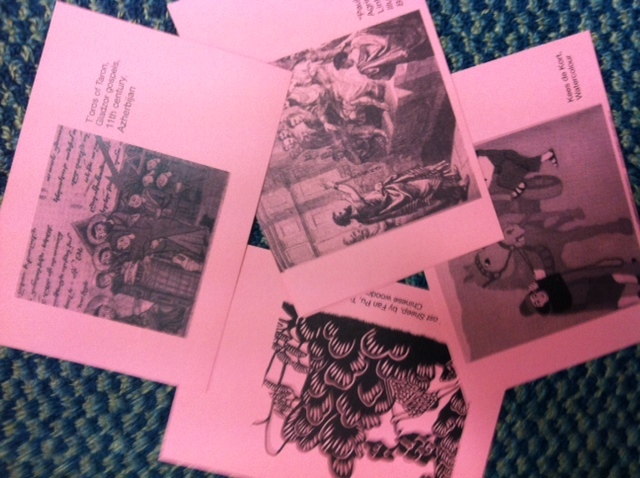 The result was some mission postcards – four in total. One side of each postcard is an art image, on the other side a Biblical text. The task will be for folk to work in groups to identify the mission practices present. 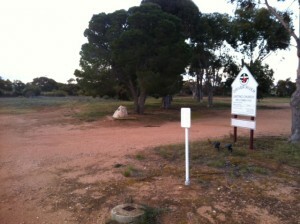 The occasion is that fact that I’m working with some rural churches in the Eyre Peninsula over the upcoming weekend. Rural as in 6 hours drive one way. So I leave on Friday morning and return Sunday evening. I am doing three of these rural events this year. In May I was in Robe, while in September I’ll be in Laura. In Robe I did 3 sessions. But there’s only time for 2 sessions in the Eyre Peninsula, which meant I needed to find a new way to get to where I wanted to go. I’d be playing with an idea for a while, emerging from Picturing Christian Witness: New Testament Images of Disciples in Mission by Stanley Skreslet. 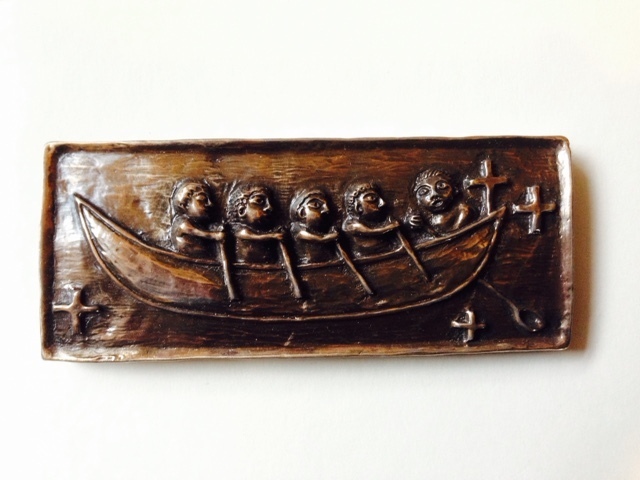 sharing the load – the determination to stretch, to extend the reach of Christian pastoral compassion. I’ll then provide some contemporary examples of each, hoping that in the mix of Biblical engagement, art, conversation and stories from today, folk will find fresh resources for their context. blossom, gently laid during the day over my car windscreen. I drove home aware of being given a gift, being offered a totally different way of looking at work – not as offices in which I work long and hard, but as a place open to grace, to the gentle gift of natures nurture. 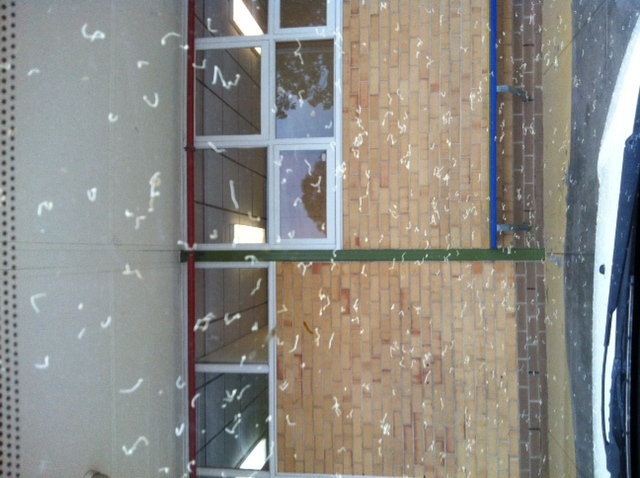 (For another blossom experience, see B=Blossom in my ever expanding Dictionary of everyday spirituality). kainga – a Maori word for home, address, residence, village, habitation, habitat. 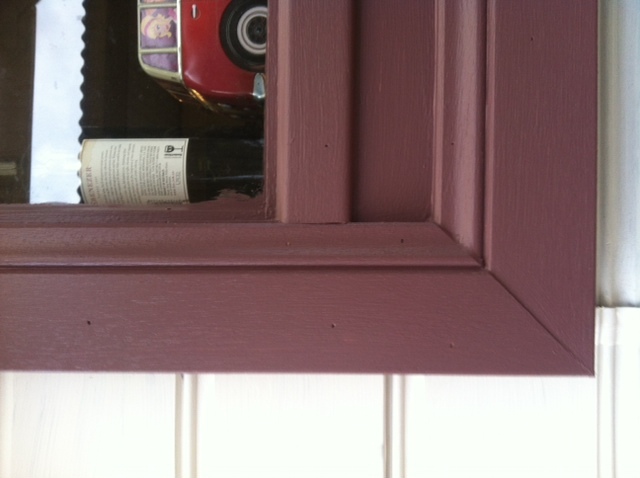 This is the colours we’re painting the outside of our house – offwhite (Quartz) walls and chocolate brown (Balsamic) windows (inside the window is a wine bottle, a gift from one of my classes, and a VW combi model). Unsure about how the stresses of being Principal would impact me, I’ve taken a month off the house. But it was good today to be back into it today. Painting top coats is always very satisfying. 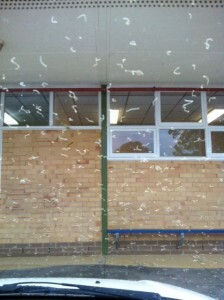 Instant gratification, although they rely on the hours of undercoat preparation. Anyhow, the overall result is pleasing. This is our kitchen window, which had totally stumped our local window tradie. He spent over 20 minutes walking around it, inside and out, scratching his head, to eventually declared he’d never before seen anything like it. The previous owners had taken a window out. The window they tried to put in place didn’t quite fit! So they just put it in anyway, leaving left 10 cm “air holes” either side. It must have been a cold place in winter! 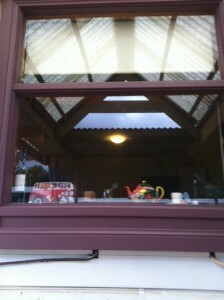 So it was out with the old window. Which also meant new exterior cladding to cater for the hole left. 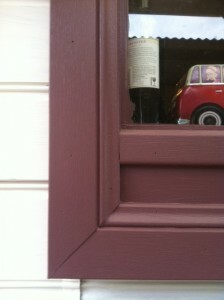 On the way, it was worth putting in batts, before a new window got inserted, undercoated and now – today – painted.